Hypoglycaemia is the term for low blood sugar level. During the first few days of life the newborn piglet is unable to mobilise the low glycogen reserves in the liver to provide adequate levels of glucose in the blood. It is therefore dependent for energy on a regular intake of lactose from the sows milk. If a piglet cannot obtain sufficient lactose to maintain its energy output, it runs out of energy, its body temperature drops and ultimately it goes into a coma and dies. Hypoglycaemia usually occurs in the first 12-24 hours of birth. Frothing at the mouth - salivation. 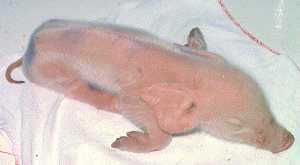 Eyes are sunken and the head bent backwards due to dehydration. This is based on the clinical signs. Examine the eyes to see that there is no evidence of rapid back and fore lateral movements which would indicate meningitis not hypoglycaemia. Low level of sugar in the blood. The following diseases can give rise to hypoglycaemia in piglets. Diahorrhoea - acute e.coli infections. Low birth rate / poor maturity. Mastitis, no milk, no colostrum. Porcine reproductive and respiratory syndrome (PRRS). 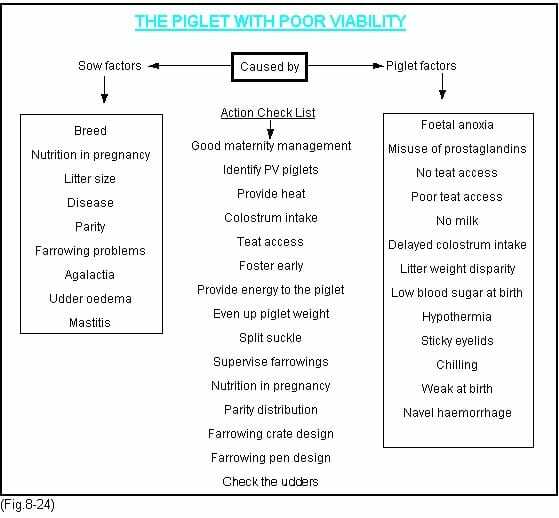 Identify potential piglets at birth and treat as describe under Poor viable piglets in the Stillborn Piglets section. The condition must be recognised early if treatment is to be successful. Immediately remove the piglet to a warm draught free environment to achieve 30ºC. A box well bedded in shavings with an infra-red lamp above is ideal. Feed the piglet with sow, or alternatively cow, colostrum or 20% dextrose solution by syringe or stomach tube every 20 minutes until it has returned to normal. Then introduce the piglet to a newly farrowed sow.